Me and my classmate's payload is a box that is 12 in by 3.5 in long. 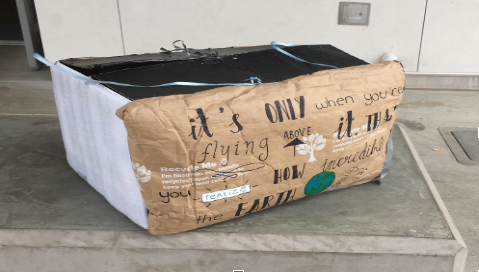 In the outside of the payload, we put flat styrofoam sheets on 2 sides, and the remaining 2 sides we put recyclable brown garbage packs. On the bottom of the payload, we put another flat styrofoam sheet. In the inside of the payload, we put styrofoam pieces and made two bases and one wall from those pieces to keep the camera in place. We made an opening for the camera. After, we just put all of the other devices to the back of the payload. Lastly, we painted the flaps of the box: black, and glued string with a glue gun for the payload to open and close.